Why are wheel bearings for Frederick vehicles important? It's simple: your wheel bearings keep the wheels on your vehicle. 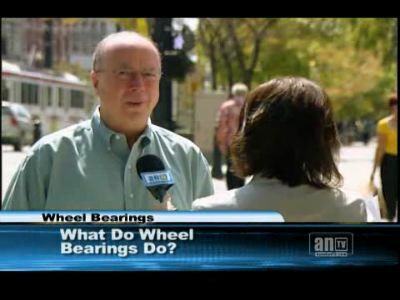 In today's Advanced Automotive Repair post, we'll discuss more about wheel bearings and how you can make sure they can do their very job while you drive around Frederick, Maryland. Wheel bearings are pretty simple parts. They're made of high quality steel and are engineered to last 100,000 miles (160,000) or more if properly cared for. The bearings do two jobs: First, they allow the wheel to freely rotate with as little friction as possible. Second, they support the weight of the vehicle. For example, if your car weighs 3,600 pounds (1600 kilogram), each wheel has to support approximately 900 pounds (400 kilograms). That's a lot of heavy lifting over those long distances. Even though wheel bearings are pretty straightforward, they need to be in near perfect condition to do their job for Frederick vehicles. The bearings are packed with heavy grease to lubricate and protect them. A seal keeps the grease in and water and dirt out. It's when the seal starts to leak that problems begin. The grease can become contaminated, causing the wheel bearings to overheat and ultimately fail. The first sign that your wheel bearings are in trouble is an unusual noise coming from a wheel. It could be a chirping, growling, rumbling or a cyclic sound. The noise could get louder or even disappear at certain speeds. Your technician at Advanced Automotive Repair can inspect for bearing wear by lifting the vehicle and checking for play in the wheel. Now some wheel bearing assemblies are factory sealed. That means that they cannot be serviced – they can only be replaced. Those that aren't sealed can be serviced on schedule at Advanced Automotive Repair. The bearings are removed, cleaned and inspected. If the bearings are still good, they're re-installed – if not, they're replaced. They are then packed in grease and a new seal is installed. If your vehicle has a factory sealed wheel bearing assembly, the entire assembly needs to be replaced when trouble arises. Unfortunately, the parts are pretty costly – but they usually last about 150,000 miles (240,000 kilometers) as long as the seals hold up. Now, even a good seal cannot keep out water that's exerting pressure on the seal. So if you've driven through hub-deep water, your bearings should be cleaned and repacked if they're serviceable. If you have factory sealed bearings, you just need to watch for signs of premature failure. If your wheel bearings can be serviced, your manufacturer's owner's manual will recommend an interval, usually around 30,000 miles (50,000 kilometers). If you have any sort of trailer, don't forget its wheel bearings. They probably need to be serviced even more frequently. This is especially true for boat trailers that are used to launch the boat by backing it into the water. These should be serviced every year, usually at the end of the season so that the bearings don't have the opportunity to rust all winter. So what happens to Frederick vehicles if wheel bearings fail? Well, the wheel can literally fall off the vehicle. I don't need to tell you how that could be. So check with your service advisor at Advanced Automotive Repair and see if your vehicle's wheel bearings can be serviced and when it's recommended. Listen for warning signs. If you've been fording streams or puddle surfing after rainstorms, be especially vigilant. Visit the automotive professionals at Advanced Automotive Repair for a wheel bearing inspection.